Southampton Independents: Bonkers Strikes Back! Southern Electric dug AROUND the car! We posted recently about a car that appeared to have been abandoned in a Redbridge street. 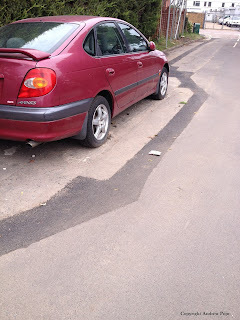 And a utility company had dug AROUND the car, because the owner had allegedly refused to move it. You loved it! It went viral! "I was told by an officer of the Council that the car was not there when another officer visited. But I visited the site this week and it was still there. I checked with one of the residents who said she had not noticed that it had been moved. "There were no signs of it having been moved either, as very old leaves remained on the front and back windscreens. I have asked again for the vehicle to be investigated. "And I can confirm that the utility company was Southern Electric. That company and I have had a few ding-dongs over the years, as shown on this blog!" Do you think it shows how inefficient the Council can be? Do you think Southern Electric should be made to re-instate the road, particularly as it in an area with a lot of listed buildings? And do you think Southern Electric should have been allowed to move the vehicle, against the will of the owner?